Philosophy has launched Pure Grace Desert Summer, a new limited edition flanker to Pure Grace. A desert summer's allure can only be described as original, illuminating, extraordinary. In an attempt to capture the unexpectedly intense beauty of this uniquely wild clime, philosophy brings you Pure Grace Desert Summer. Freesia, ozone, star jasmine and cool cactus blossom meet in a breathtaking blend of fresh florals, anchored by pink clay, blonde woods and musk for a truly special experience. Summer is fleeting, but its free spirit lives on and on. 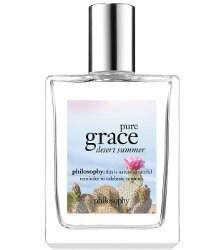 Philosophy Pure Grace Desert Summer can be found now at Macy's, $49 for 60 ml.